Double session burst training is an extreme, 6 week-blitz, geared to diametrically increase muscle mass while shedding body fat. Like most great things, this type of training will require dedication. Read below if you are not frail of heart. I have successfully used this program with several clients to achieve supra-physiological results. Gains of 10 lbs of lean mass and a decrease of 6-8 lb. of fat mass is common, depending on strict adhesion to the nutritional and chemical recommendations. Tap into as many muscle fibers as possible. The easiest way to do this is to include multiple rep ranges at many angles to ensure you are challenging as many fast, intermediate and slow-twitch muscle fibers as possible. Another way is to include ample amount of volume and intensity for each muscle group. However, precautions must be taken. After approximately 45-60 minutes of weight training, testosterone levels begin to drop, and cortisol (catabolic hormone) levels increase. This is not good. Therefore escalating the amount of volume and intensity can lead to disaster. Click Here For The Top Selling Cortisol Blocking Products. Secondly, mixing too many high rep sets with low reps sets will greatly interfere with your strength within the same session. This is where double session training comes in. By simply dividing the training into two, brief, sessions per day, and using different rep ranges in each, you can avoid these pitfalls. The same body parts are worked in 2 daily training sessions. Reason: to stimulate as many motor units within that particular muscle group. Workouts should be spread 4-7 hours apart. Reason: To take advantage of the natural hormonal /nervous system widow that exists. Research has shown that testosterone levels will restore enough in that time period in order to train a second time. Plus, the nervous system stimulatory effect from the first workout will carry over to the second session. Exercise scientists call this occurrence "tetanus facilitation". In simple terms, every muscle contraction leaves a residual electrical impulse. This way the body uses the morning workout to "jack up" the evening session. This means the trainee is able to train harder, later in the day. After 8 hours, this excitation dissipates. Morning workouts include lower reps ranges, evening workouts include higher reps. The reason is to maximize the stimulatory effects of the nervous system. Volume must be kept moderate to avoid over training. (20 sets per session max.) Reason: Anabolic levels will decrease and catabolic levels will increase to a point beyond a favorable rebound. Post workout nutrition must be followed carefully. This is the best way to reduce cortisol and restore hormone levels. As the name implies, training twice per day allows the trainee up to two anabolic hormonal "bursts" per day. Ya gotta be careful though, that can also mean up to two catabolic bursts, if strict nutritional guidelines are not timed exactly. For Individuals with 10% body fat or lower: 1/2 bodyweight = grams of simple carbohydrates (1/4 if on pre-contest bodybuilding program). The first choice is maltodextrin, dextrose is second choice. If you are over 10% bodyfat or extremely sensitive to carbohydrates (you gain fat easily or feel lethargic when on medium to high carb diet), use an extra 25g of glutamine in addition to the amount listed below, and omit the sugars. Same as AM shake BUT if on pre-contest bodybuilding; have solid white meat protein source, 3 cups fibrous green vegetables, 10 g BCAA&apos;s, 3 g l-Arginine, 2g vitamin C, and 25g glutamine. Consume 2 times bodyweight lb. in grams of protein per day (ex; 200 lb. = 400g) Included in this total post session shakes and glutamine. The following is a 6 week, 5 day per week program. Two sessions per day are trained on weeks 1,2,4,&5. One session per day is trained weeks 3 & 6. A2 Sternum chin-ups (use extra load attached to hips or dumbbell between feet if possible) Fig 1 - Grasp chin-up bar with an overhand, shoulder width grip. Start hanging in full elbow extension. Next, flex the elbows and elevate the torso until the sternum makes contact with the bar. 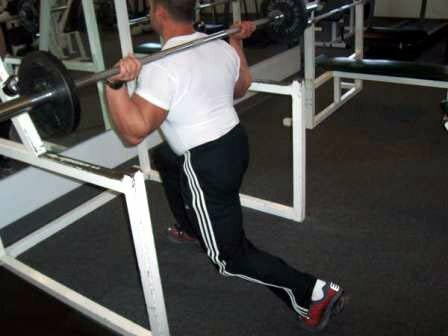 Lower the body in reverse order. Tip-the torso is angled backward and the lower back arched. Do NOT substitute the pulldown. 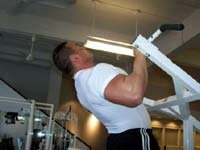 However, the assisted chin-up machine may be used if unable to do a chin-up. 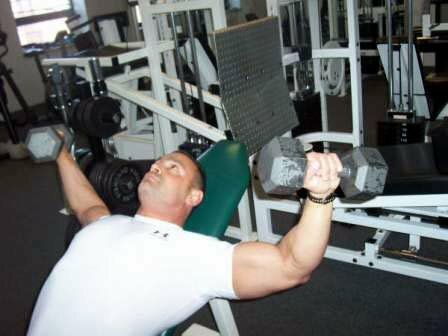 B1 Flat bench, parallel grip, dumbbell Press - Extend the elbows from the chest with the palms facing one another. B2 Bent over low barbell row to abdomen - Torso angle is 45°. Click Here For A Printable Log Of Day 1 - Chest/Back AM. A1 Incline dumbbell fly Fig 2 - Incline is set at 75 degrees. Grip is pronated. Elbows are pulled down and back toward ears. A2 Lat pulldown, close grip, V-bar- Elbows are pulled down and into sides. Shoulders are depressed toward hips. C Low cable pull-in crunch (Fig 5) -Positioned the VecroTM belt attachment around the knees. Place a dumbbell across the chest for extra resistance. Simultaneously, flex your hips, knees and torso toward the bodies mid point. Extend the knees, hips and torso to lower the load. Click Here For A Printable Log Of Day 1 - Chest/Back PM. A1 Hack squat - Feet are positioned close and under body. A2 Dumbbell semi-stiff legged dead lift (Fig 6)- Feet 6" apart, toed out slightly. B Barbell split squat (Fig 7) - Similar to a lunge, without the thrust backwards. Using a squat or power rack, grasp a barbell and place it on the base of your upper trapezius. Split your stance so that one leg is behind the other approximately 4-5 feet. Next, flex both knees and lower the torso so that the forward hamstrings cover the calf in the lowered position. Click Here For A Printable Log Of Day 2 - Legs AM. Click Here For A Printable Log Of Day 2 - Legs PM. B1 Standing Barbell curls - Use straight bar. Click Here For A Printable Log Of Day 4 - Arms/Shoulders AM. A2 EZ bar triceps extensions - Extend the bar from the bench to a position behind the head. C Lean away lateral raise (Fig 8) - Slightly rotate wrist at top (thumb down). Tip- Keep shoulders depressed and rotate neck away from working side to relax traps. Click Here For A Printable Log Of Day 4 - Arms/Shoulders PM. Click Here For A Printable Log Of Day 6 - Chest / Back AM. Click Here For A Printable Log Of Day 6 - Chest / Back PM. A final note about recovery - Although exceptional progress will be made with this program, optimum results can only occur if there is a balance between training and recovery. The Soviets called this concept, "planned unloading". To take advantage of this, every third week, perform only one session per day (the AM session). Then, week 4 & 5, double split training may be utilized again. Week 6 is again an unloading week, training 1 session per week.